I think this is my favorite bag now! I love everything nautical and I love these colors....cute shoes, too! What size do you wear? hahahaha! Have a good week my friend! Hugs! Very nice bag! And looks easy too. 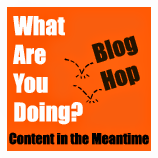 Thanks for sharing your post on my What Are You Doing? Blog Hop! Thanks ladies! My pleasure Sara!